I think we do good work at Children International, and to demonstrate that, we use fact-based reporting: outcome indicators, metrics, a full set of quantitative measurement tools – we got 'em. As a professional organization, it's essential that we substantiate our work in a clear way. Tangible evidence that CI produces results shows you we are using your contributions to maximum effect. I was speaking with Mirza Julio, our program manager in Cartagena, Colombia, who said they have made good progress with our Into Employment® program this year. Our Cartagena staff has been able to help place a good number of youth in jobs recently as they concluded their training. That's encouraging news, of course, but what really caught my attention was Mirza's comment that a number of youth explored the job market on their own following training and identified potential employers. These youth then set up their own job interviews and, in many cases, secured employment. When you see a teenager or young adult take responsibility for their future and well-being by taking that kind of initiative, I know CI is doing something right. That's one of those intangible qualities that is hard – maybe even impossible – to measure in quantitative terms. But that doesn't make it any less valid as a way to understand the value of our investment in young people. Those youth in Cartagena are driven to make their lives better and take full advantage of the opportunities we have offered them to discover and realize their potential. This kind of confidence in their abilities is expressed by other youth, such as 19-year-old César Ullco in Quito, Ecuador. César's father died a few years ago and his mother sells food as a street vendor. 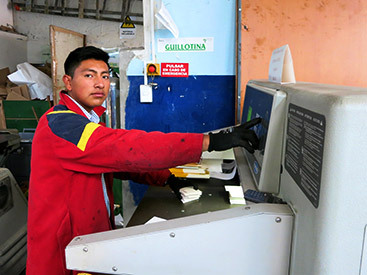 Following his training with the Into Employment Program, César went to his job interview at a printing company full of confidence. He commented, "I felt very calm going into the interview, because through the Into Employment training, I knew how to present myself and what to say." César's pay has more than doubled the household income, and he hopes to go to university someday. 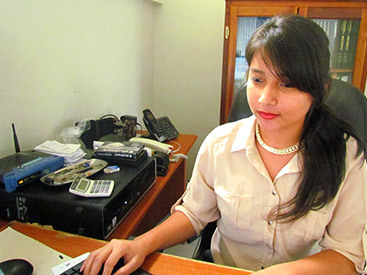 Following her training in computer operation and job-readiness skills, Perla Quiroz, 19, now works for a customs broker in Honduras and also aspires to continue college in the future. In the meantime, she is helping cover her family's regular expenses and encourages other youth to study and take advantage of opportunities like Into Employment. Perla's story and those of César and the Cartagena youth are repeated throughout the seven countries where our Into Employment program operates. You can be sure their successes are entered into the statistical record that lends validity to the program. At the same time, each of these youth displays the motivation and confidence in their ability to work their way out of poverty and build a solid future. And CI will be sure to report those intangible qualities right alongside the hard numbers. Learn more about Children International's Into Employment® program.